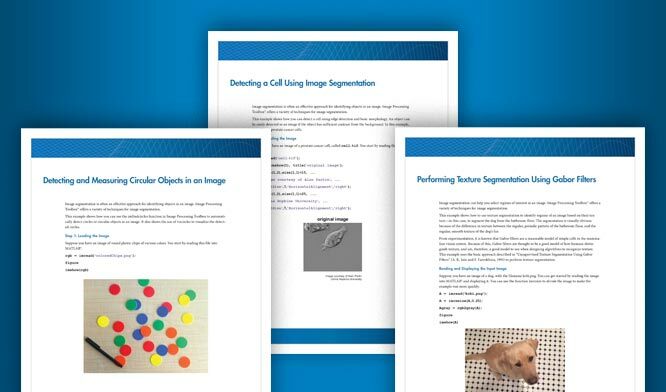 This example shows how to create a simple app that provides information about pixels and features in an image using modular pixel information tools. This example shows how to build an app for navigating large images using modular navigation tools. This example shows how to make the connections that enable modular tools to interact. This example shows how to create a tool that measures the angle between lines drawn over an image. You can combine interactive tools to create custom image processing apps. Some available tools include contrast adjustment, metadata display, pixel information, magnification, and cropping. Learn how to create a modular tool and how to associate it with a target image. Learn about the utility functions available for creating custom modular interactive tools. To customize the interactivity of a modular tool with a target image, use event notifications from the modular tool APIs.